A high percentage of corn fields may receive substantially more N fertilizer than is economically optimum, for which there are no obvious visual signs. Conversely, fields deficient in N have obvious visual cues, such as stunted growth and yellowing leaves. The Corn Stalk Nitrate Test (CSNT) has been used for two decades by farmers and consultants as an end-of-season tool for evaluating field-specific corn N management practices. More recently, it has been strongly promoted as a tool for producers to aid in fertilizing to maximum profits by determining whether the crop has received deficient, adequate, or excessive amounts of nitrogen, and has been endorsed by many as part of an adaptive management approach. However, we submit that the promotion of CSNTs should be reconsidered based on the existing evidence of its imprecision. Low (less than 250 ppm nitrate-N, in some states 450 or 750): high probability that the crop was N deficient. Optimal (generally between 250 and 2000 ppm nitrate-N, in some states also including a “marginal” range when below 750): high probability that yields were not limited by N, and no apparent excess. Excess (>2000 ppm nitrate-N): high probability that N uptake exceeded plant needs. 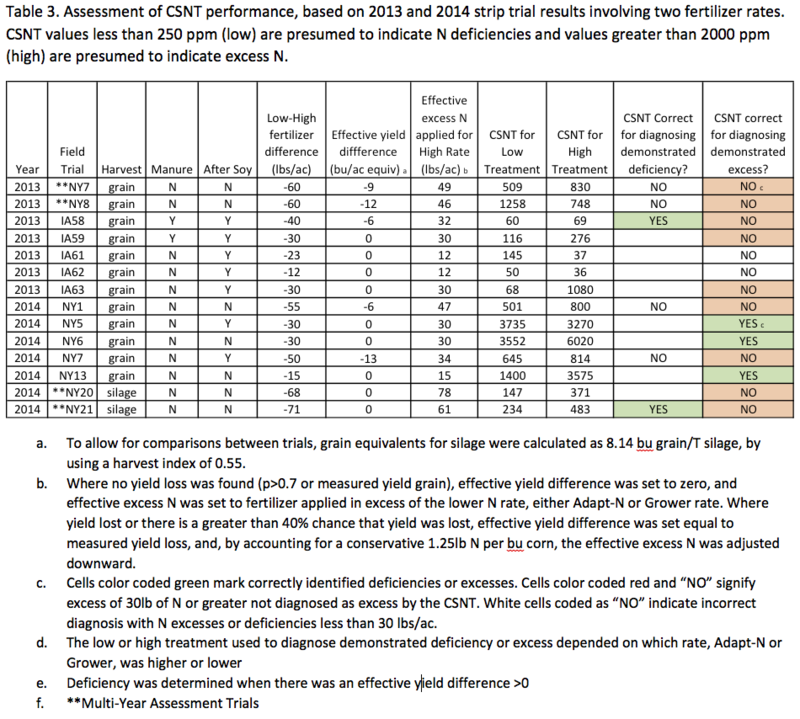 The CSNT’s post-mortem evaluation is supposedly useful to growers for deciding future N management. With multiple year assessments, protocols state that appropriate consideration should be given for weather conditions, and fertilization rates should be increased for fields that usually test in the low range and decreased when CSNTs are in the excess range. Following this logic, continued use of the test would allow growers to fine-tune adjustments toward optimal rates. In this, we need to consider the accuracy of the CSNT, notably its ability to detect (i) N deficiencies and (ii) excessive N applications. It has been reported in journal articles and fact sheets that yield adequacy is often observed with CSNT values in the “low” range, which indicates that the test is a weak indicator of N deficiency (What’s Cropping Up? Vol.22 No.3). An Iowa report based on a large data set of N rate trials (Sawyer, 2010) indicated that 15% of CSNT values in the “low” range were false positives, while of cases with field-verified N deficits, 30% of CSNT results were false negatives. In addition, a Maryland study involving 10 experiments (Forrestal et al., 2012) found about one third of “low” CSNT values to be false positives for deficiencies. In other words, adequate fertilizer was applied when the CSNT reported N deficiency. For accurately detecting N excesses, earlier research from New York suggests that fields with excessive N applications may still show low or optimum CSNT values (What’s Cropping UP? Vol.21 No.3) and that site differences affect CSNT values more than excess or deficient fertilizer rates (Katsvairo et al., 2003). The aforementioned Iowa report (Sawyer, 2010) also indicated that 33% of cases with field-verified excess N applications were not identified through the test. The Maryland study found as much as half of the CSNT results to be false negative for excessive nitrogen. 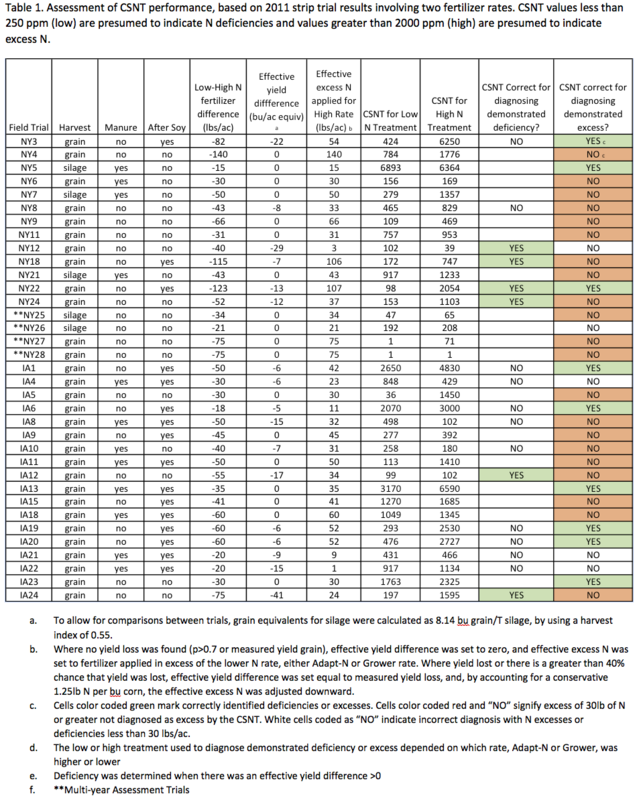 As part of research on the Adapt-N tool (http://www.adapt-n.com/), we conducted strip trials from 2011-to-2014 (including 14 multiple year assessment trials) that provided the opportunity for us to evaluate whether the CSNT is an effective tool for adaptive nitrogen management in corn production. Ninety-one replicated strip trials on commercial and research farms were conducted for four growing seasons (2011-2014) throughout New York (49 trials) and northern Iowa (42 trials). They involved two rates of N, a “high” rate and a “low” rate, which resulted in field-scale strips with N rate differences ranging from 10 to 140 lbs/ac. The rates were set by applying a conventional “Grower” rate or using the Adapt-N tool to make an adaptive N recommendation. In most cases the Grower rate was higher. Trials had 3 to 8 replications for each treatment (except for 13 trials that with only single strip yield measures but replicated CSNT values). Trials were distributed across both states under a wide range of weather conditions, and involved grain and silage corn, with and without manure application, and rotations of corn after corn and corn after soybean (Tables 1, 2, & 3). To allow for comparison across all trials, silage yield values were converted to grain equivalents (8.14 bu grain per ton silage, using a harvest index of 0.55). 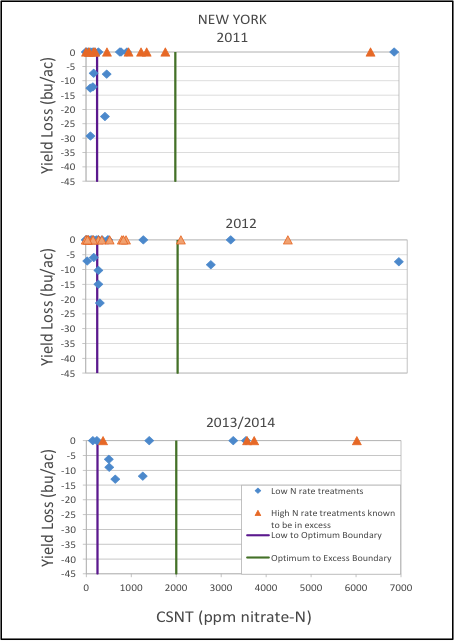 The yield results from a majority of the trials showed unambiguous over-fertilization associated with the higher N rate (same yields for both rates). In these cases, where there was no further yield gain with added N (within 5 bu/ac), the “effective yield difference” was set to zero. If there was a yield difference higher than 5 bu/ac the “effective yield difference” was set to the difference between the high and low rates. Where there was unambiguous over-fertilization with the higher N rates, the amount of “effective excess N applied” was set to the N rate difference between treatments (Tables 1-3). In some cases the low rate provided insufficient N (reduced yields), and the optimum N level appeared to be between the high and low rates. In these cases, the amount of effective excess N applied was estimated by subtracting a conservative 1.25 lb N from the N rate difference between the treatments per bushel of yield lost due to the lower rate. Fifteen corn stalk sections, sampled from each replicate strip, were dried, ground, and analyzed for nitrate content, according to published protocols. Means for each treatment are presented in Tables 1-3. The utility of the CSNT was then assessed by evaluating the relationship between N rates, test values, and yield losses, and determining whether it accurately diagnosed field-demonstrated deficient or excessive N levels. First, we evaluated whether CSNT values for the higher N rates were in fact higher than those for the lower N rates, which is an indicator of the precision to varying N levels. Overall, the CSNT values were higher for the low N rate in 31% of cases in NY and 26% of cases in IA, suggesting that in a significant number of cases the test was unable to reflect the actual N rate differences and results were presumably obscured by high variability. In many cases without yield loss CSNT values were below the 250 ppm “low” threshold, indicating frequent false positives for N deficiencies: The tool often identified deficiencies when in fact there were none. Many cases with yield losses were associated with CSNT values greater than 250 ppm, indicating frequent false negatives for deficiencies: The tool often did not identify deficiencies when fertilizer N levels were in fact deficient. In a few cases high CSNT values (>2000 ppm) were not associated with excess N rates. I.e., infrequent false positives for N excess: When the test indicated excess N, it was generally correct. In many cases with excess N rates the CSNT did not show high values (>2000 ppm).e., frequent false negatives for N excess: The tool often did not identify excesses when fertilizer N levels were in fact excessive. Figure 1. New York 2011-2014 yield losses and CSNT values from the lower rate treatments in all trials, and for higher rate treatments in those trials where excess was unambiguous (no further yield gain with further added N). Orange triangle symbols with CSNT values less than 2000 ppm are false negatives for excess N. Blue diamond symbols with CSNT values greater than 250 are false negatives for N deficiencies. All symbols that show CSNT values less than 250 but no yield losses (top left of graph) are false positives for N deficiencies. Figure 2. 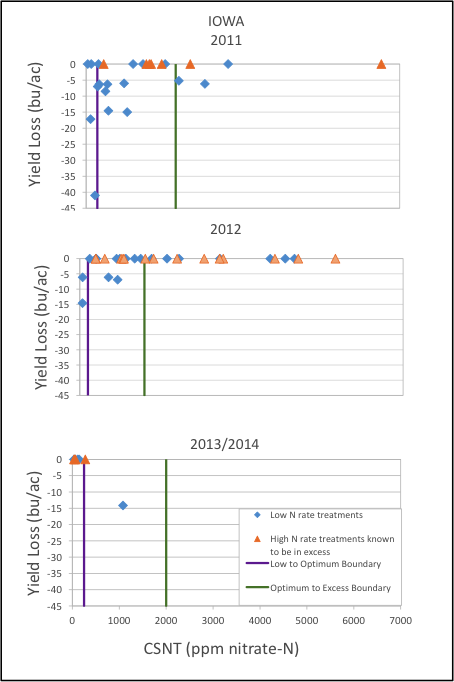 Iowa 2011-2014 yield losses and CSNT values from the lower rate treatments in all trials, and for higher rate treatments in those trials where excess was unambiguous (no further yield gain with further added N). Orange triangle symbols with CSNT values less than 2000 ppm are false negatives for excess N. Blue diamond symbols with CSNT values greater than 250 are false negatives for N deficiencies. All symbols that show CSNT values less than 250 but no yield losses (top left of graph) are false positives for N deficiencies. Summarized results (Table 4) show that when CSNT values greater than 2000 ppm were measured (“excessive”), a high probability existed that indeed excess N was applied – only 6% (NY) and 8% (IA) false positives. This is the only criterion by which the test performs well. However, excessive N rates (no yield losses) can result in a wide range of CSNT values and we found that more than half of the fields with proven excess N application of greater than 30 lbs/ac (65% for NY AND 53% for IA) did not show CSNT values greater than 2000 ppm. I.e., the test failed to detect excess N rates in the majority of cases. Similarly, the CSNT generally performs very poorly when trying to detect deficiencies, with failure rates typically above 50% for both false positives and false negatives. Table 4. 2011-2014 New York and Iowa trials, showing the proportion of CSNT values that correctly or incorrectly identified field-demonstrated deficiency or excess status. We conclude from these 91 strip trials over four years that the test has very limited ability to support management decisions. The poor utility for detection of N deficiencies was well known from the literature, although not recognized by many. Our results confirm this. The primary question therefore was whether the test can effectively detect excessive N applications. The answer appears to be a strong “no”. Although “excessive” CSNT values were reliably associated with over-fertilized plots (only 6-8% false positives), the test failed to identify over-fertilized crops (30 up to 140 lbs/ac) in about two-thirds of the cases in NY and half the cases in Iowa. I.e., a majority of the excessive N cases were not identified by the test. Since the test’s primary utility is related to determining excessive N rates, it appears to perform weakly in serving its main purpose. An additional concern is that end-of-season evaluations of the current growing season have limited value for the predictability of N needs in future growing seasons. Research has demonstrated (summarized by van Es et al., 2007) that weather conditions during the early growing season greatly affect N losses and are a critical factor in determining optimum N rates. This implies that CSNT results from one growing season have limited value for predicting N needs for the next year when the weather may be very different. Overall, we conclude that the CSNT is not an effective tool for use in field-specific adaptive N management, primarily because it fails to identify the majority of cases with excessive or deficient N levels. This work was supported by grants from the New York Farm Viability Institute, the USDA-NRCS Conservation Innovation Grants Program, the Northern New York Agricultural Development Program, and the International Plant Nutrition Institute. We are grateful for the cooperation in field activities from Bob Schindelbeck, Keith Severson, Kevin Ganoe, Sandra Menasha, and Anita Deming of Cornell Cooperative Extension, from Dave DeGolyer, Dave Shearing and other staff at the Western NY Crop Management Association, from Eric Bever and Mike Contessa at Champlain Valley Agronomics, and from Shannon Gomes, Hal Tucker, Michael McNeil and Frank Moore in Iowa, as well as the many farmers who implemented these trials. Blackmer, A.M. and A.P. Mallarino. 1996. Cornstalk Testing to Evaluate Nitrogen Management (PM-1584). Iowa State Univ. Extension. Available on the Web at: http://www. extension.iastate.edu/Publications/PM1584.pdf. [URL verified 2/14/12]. Sawyer, John. 2010. Corn Stalk Nitrate Interpretation. Integrated Crop Management News. Iowa State University Extension and Outreach. http://www.extension.iastate.edu/ CropNews/2010/0914sawyer.htm [URL verified 3/11/12]. van Es, H.M., B.D. Kay, J.J. Melkonian, and J.M. Sogbedji. 2007. Nitrogen Management Under Maize in Humid Regions: Case for a Dynamic Approach. In: T. Bruulsema (ed.) Managing Crop Nutrition for Weather. Intern. Plant Nutrition Institute Publ. pp. 6-13. Managing N for Weather_Ch2.pdf . 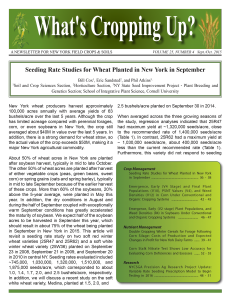 Multiple years of data collection and research have led to the creation and testing of a variable rate seeding model customized to the conditions of New York State. Thanks to the statistical analysis by Cornell Professor, Dr. Michael Gore, and PhD student, Margaret Krause, the Precision Ag Project is gearing up to test this model on select fields in 2016. The Cornell research team has spent the summer analyzing the 2014 project data. The team has been examining the data using different statistical techniques to create a model that will select hybrids and population rates given certain soil properties and characteristics. For the first round of preliminary analysis, the team has focused in on six major data types; seeding rate, hybrid, topographical information, NRCS soil survey maps, Veris soil sampling data, and grid soil sampling data. It is important to note that four of the above data types are accessible to growers who are involved in precision farming at almost any level. The variables of seeding rate, hybrid, and topographical information can all be taken from the display monitor in the form of as-applied data. Though the accuracy of NRCS Soil Survey maps can be highly varied across the State, they were included in the analysis as they are publically available and easily accessed online. Figure 1. Veris data takes nearly continuous measurements as it travels across the field. Here, organic matter data points are shown. The two types of precision soil sampling data used in the analysis are services that growers can purchase from several companies. Of the two methods, the Veris soil sampler provides the highest resolution of soils data for pH, electrical conductivity, and organic matter. The Veris takes these measurements every few seconds as it is pulled across a field (Figure 1). It is a very slow process, however, and requires near perfect field conditions and a highly skilled operator to obtain accurate data. For these reasons, the project only has Veris data on approximately 600 acres. Figure 2. Grid soil samples taken on 1/2 acre grids must be interpolated to create a heat map which assigns a value to each point in the field (shown on bottom). By contrast, grid soil sampling is significantly more time efficient and forgiving of field conditions. The grid sampler collects and geo-locates soil samples in ½ acre grids. Each sample then receives a standard fertility test which yields approximately twenty soil characteristics. 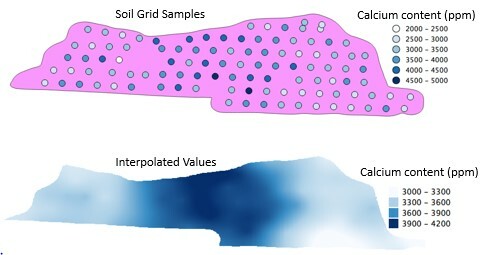 As the samples are done in grids and not continuously like the Veris, the values must be interpolated to assign each point in the field a value (Figure 2). The project is in its third year of data collection with 2700 acres and ten growers involved over that time. This article will only discuss the preliminary analysis of one field in 2014 for demonstrative purposes. The project will release more thorough results and analysis as it is completed. Figure 3. The experimental prescription divides the field into two acre blocks and randomly assigns each block one of four seeding rates. This section will walk through the model analysis of the field and demonstrate how the model generates a variable rate seeding prescription. The analysis presented is focused on a 2014 grain corn field located in Sackets Harbor, NY. The field is in a corn-soybean rotation with conventional tillage and 30” rows. 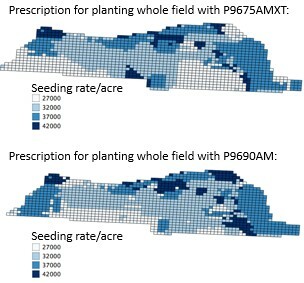 It was planted with a split planter using the hybrids P9675AMXT and P9690AM and the project’s randomized design prescription (Figure 3). Figure 4. 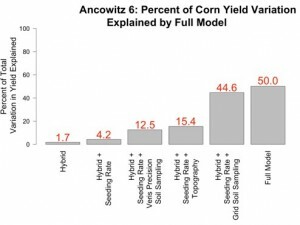 The percent of corn yield explained by each data type. When the model was run, it was determined that hybrid and seeding rate together only accounted for 4.2% of the variation in yield (Figure 4). 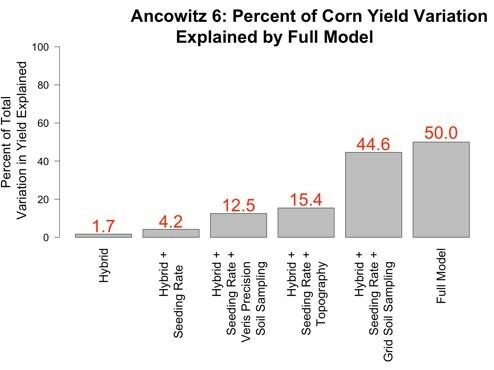 Some growers would have expected to see these two factors contributing more to the yield picture, however, this simply tells us that there are several other important variables that need to be included in the model for this field. Figure 5. 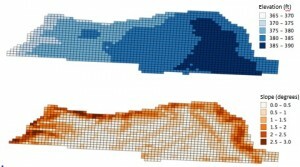 Topography data shows a largely uniform field in slope and elevation. Topography is one such variable. 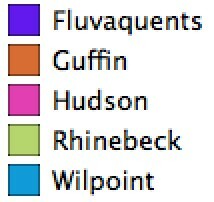 Due to the glaciation of the soils across New York State, topography can be highly varied in a single field. As this field is located in Sackets Harbor, the topography happens to be fairly uniform. There are some low spots, but the field is largely flat with some downward sloping around the edges (Figure 5). As a result of its uniformity, the topography data of elevation, slope, aspect, and curvature only account for 11.2% of the yield variation (Figure 4). Figure 6. The NRCS soil survey map shows six soil types in this field. The NRCS soil survey maps also represented this field as fairly uniform. Though the map shows five different soil types in this sixty acre field, the soil types are fairly similar in terms of their sand, silt, and clay content (Figure 6). 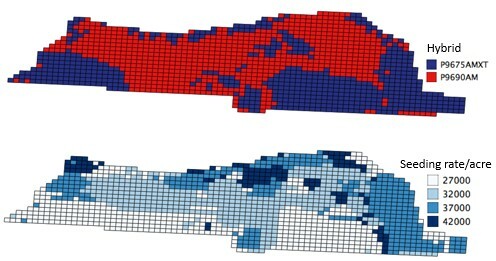 The model determined that in this case, the NRCS soil survey map explained less than 1% of the yield variation and was therefore dropped from the model. In the next phase of analysis, the model has added in the precision soil sampling results. As expected, these data help to explain more of the yield picture. The Veris samples captured organic matter and cation exchange capacity at this location. While only capturing two soil properties, the Veris data was able to explain 8.3% of the yield variation (Figure 4). When the grid soil sample results were run in the model, it was determined that they accounted for 40.4% of the yield variation (Figure 4). As this method of sampling captures over twenty soil parameters, this result is not unexpected. It does, however, emphasize the huge potential that grid sampling holds in the development of variable rate seeding prescriptions. The full model combines all of the above variables and determines how much they collectively contribute to yield. In this field, 50% of the yield variation was explained using just these four data types (Figure 4). 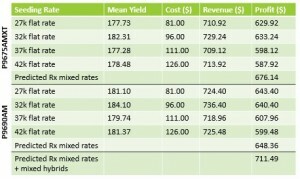 As the model combined the data types, it was able to progressively explain more yield. This suggests that these data, the grid sampling in particular, are capturing a large amount of the variation in the field. As the analysis continues, more data types such as precision weather and crop health will be included in the model to explain more yield. Figure 7. The model generated variable rate seeding prescription for each of the hybrids. The end goal of this model is to use it to make predictive variable rate seeding prescriptions for growers. This is done by breaking the field into small grids and running the model in reverse. Now, the model is given all the soil and topographical characteristics and asked which seeding rate will optimize yield, or profit, for that grid and hybrid (Figure 7). It is important to recognize that a prescription written for maximum yield can look quite different from one written for maximum profit. These prescriptions can shift dramatically as the commodity prices change which emphasizes the importance of watching the markets and input costs to make the best management decisions. Figure 8. The model generated variable rate seeding prescription for a multi-hybrid planter using P9675AMXT and P9690AM. As a result of multi-hybrid planters coming onto the market, the model was also run to determine the optimal seeding rate and hybrid choice for each grid (Figure 8). In this scenario, a visible planting rate-hybrid interaction can be seen between the two maps as each hybrid has optimal seeding rates given certain field and soil conditions. These example prescriptions showcase the potential that the project has to evolve and meet grower needs as agricultural technology continues to rapidly advance. To demonstrate the cost benefit of utilizing these technologies, a brief economic analysis was done comparing the model to grower practice. The economic analysis of the variable seeding rate prescriptions is promising for this field. The grower typically plants a flat rate of 35,000 seeds/ac at this location but the model predicts that it can dramatically increase that with the variable seeding rate prescriptions it has generated. 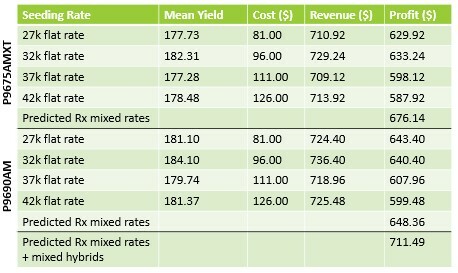 For P9690AM the model predicts an increase of $24.18/ac and $60.46/ac for P9675AMXT (Table 1). For hypothetical purposes, if the grower was to use a multi-hybrid planter with these two hybrids, the model predicts a profit increase of $91.56/ac. These results show a huge potential for the success of variable seeding rate technology as well as precision soil sampling in New York State. As it is still in its pilot state, the model generated variable rate seeding prescriptions will begin testing on select fields in 2016. As the analysis continues, additional statistical techniques will be used and additional years of data will be incorporated to make the model more robust. It can be expected that in 2017 the model will be released on a larger scale. This first pass of the data has demonstrated that as more data types are added, more of the yield is explained. As a result, the project would like to expand the breadth and resolution of the collected data types through precision weather data, precision UAV data, and expanded precision soil sampling. Looking to the 2016 season, the project is aiming to expand grower involvement to help further the development of the model. Increasing total acreage across the State will help to capture more climatic and topographical variation. This is critical in creating a model that can be used accurately by growers in all regions of the State. A key to this expansion will be increasing the acreage with precision soil sampling data. In order to facilitate this, the project offers the grid soil sampling at 50% cost-share on all acres that are committed to participate in 2016. This Fall, there will be a round of post-harvest grid soil sampling, and those interested in sampling at that time are encouraged to contact the project as soon as possible. Anyone interested in participating in the research project or the precision soil sampling is encouraged to contact Savanna Crossman at savanna@nycornsoy.com or (802) 393-0709. New York wheat producers harvest approximately 100,000 acres annually with average yields of 63 bushels/acre over the last 5 years. Although the crop has limited acreage compared with perennial forages, corn, or even soybeans in New York, the crop still averaged about $40M in value over the last 5 years. In addition, there is a strong demand for wheat straw, so the actual value of the crop exceeds $50M, making it a major New York agricultural commodity. About 50% of wheat acres in New York are planted after soybean harvest, typically in mid to late October. The other 50% of wheat acres are planted after harvest of either vegetable crops (peas, green beans, sweet corn) or spring grains (oats and spring barley), typically in mid to late September because of the earlier harvest of these crops. More than 60% of the soybeans, 20% above the 5-year average, were planted in May this year. In addition, the dry conditions in August and during the half of September coupled with exceptionally warm September conditions has greatly accelerated the maturity of soybean. We expect half of the soybean acres to be harvested in September this year, which should result in about 75% of the wheat being planted in September in New York in 2015. 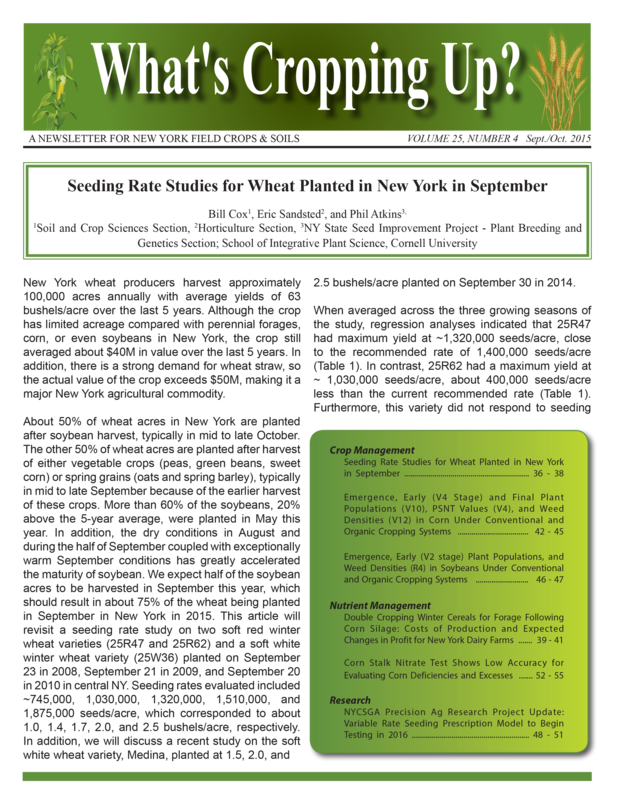 This article will revisit a seeding rate study on two soft red winter wheat varieties (25R47 and 25R62) and a soft white winter wheat variety (25W36) planted on September 23 in 2008, September 21 in 2009, and September 20 in 2010 in central NY. Seeding rates evaluated included ~745,000, 1,030,000, 1,320,000, 1,510,000, and 1,875,000 seeds/acre, which corresponded to about 1.0, 1.4, 1.7, 2.0, and 2.5 bushels/acre, respectively. In addition, we will discuss a recent study on the soft white wheat variety, Medina, planted at 1.5, 2.0, and 2.5 bushels/acre planted on September 30 in 2014. 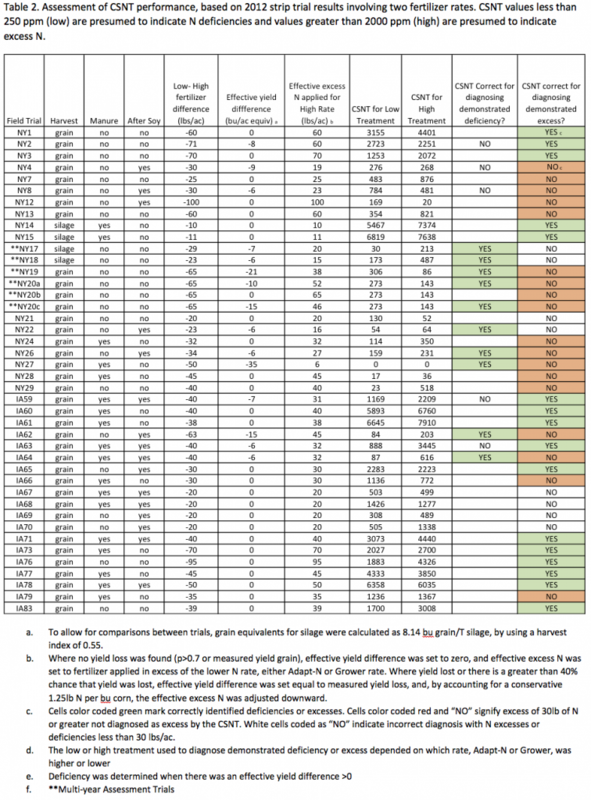 When averaged across the three growing seasons of the study, regression analyses indicated that 25R47 had maximum yield at ~1,320,000 seeds/acre, close to the recommended rate of 1,400,000 seeds/acre (Table 1). In contrast, 25R62 had a maximum yield at ~ 1,030,000 seeds/acre, about 400,000 seeds/acre less than the current recommended rate (Table 1). Furthermore, this variety did not respond to seeding rates in the last two years of this study. Many growers in NY, however, also harvest wheat straw because of the strong demand by nearby dairy producers. In contrast to grain yields, straw yields of 25R47 and 25R62, when averaged across the three growing seasons, had maximum yield at ~1,510,000 seeds/acre, mainly because of the more positive response to seeding rates in the last two growing seasons (Table 1). The data indicate that current soft red winter wheat varieties planted in late September in NY exclusively for grain could be seeded as low as 1,000,000 and 1,300,000 seeds/acre, if growers do not harvest the straw and input costs are an issue. If wheat growers harvest the straw, however, seeding rates should remain at ~1.500,000 seeds/acre. Seeding rates of soft white winter wheat varieties traditionally have been ~2 bushels/acre for a September planting date. The soft white winter wheat variety, 25W36, had maximum grain and straw yields at ~1,375,000 seeds/acre when averaged across the three growing seasons (Table 2). This corresponded to a seeding rate of about 1.8 bushel/acre, close to the recommended seeding rate. It is interesting to note that the soft white variety had a more consistent response to seeding rates across the three years than the two soft red varieties. In our 2014-2015, study, however, Median, a soft white winter wheat variety, did not respond to seeding rates with similar yields at 1.5, 2.0, and 2.5 bushels/acre (Table 3). Yields, however, were low in 2015 probably because of the late green-up (early April) after the very cold winter, the wet conditions in May (5.56 inches of precipitation), which probably resulted in loss of some top-dress N, and exceedingly wet June conditions (8.00 inches! ), which resulted in significant head scab. If NY wheat growers are marketing only the grain, seeding rates for soft red winter wheat varieties should range from ~1,000,000 to 1,300,000 seeds/acre, if planting the crop in mid to late September. If soft red winter wheat producers also harvest and market the straw, seeding rates should be ~1,500,000 seeds/acre for a September-planted crop. In 2010-2011, we did observe increased lodging at seeding rates above 1,375,000 seeds/acre, which probably contributed to the yield decline at the higher seeding rates for grain yields in the soft red winter varieties (although straw yields continued to increase). A soft white winter variety, 25W36, had mostly consistent maximum grain and straw yields at ~1,375,000 seeds/acre (~1.8 bushel/acre) across growing seasons so higher seeding rates are not required for September-planted wheat. In the very wet 2015 spring, grain yield of another soft white winter variety, Medina, did not respond to seeding rates above 1.5 bushels/acre. 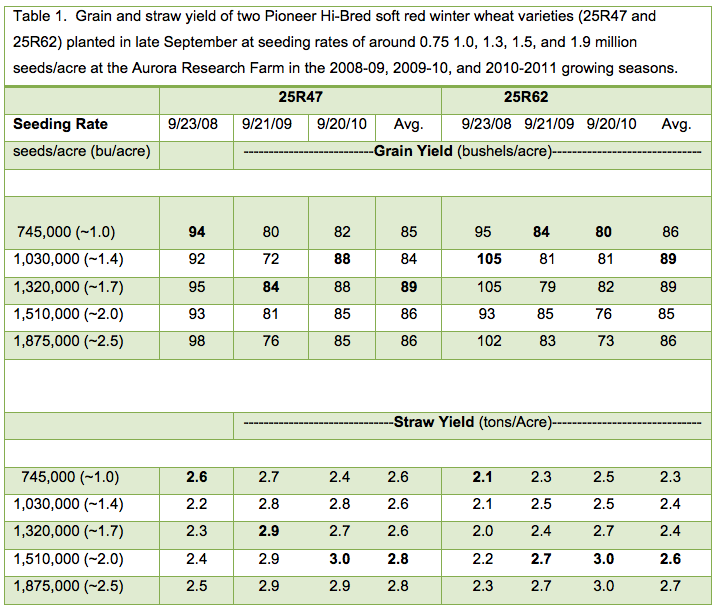 Although many NY wheat growers plant at greater than these recommended seeding rates, yields are seldom increased. In addition, the risk of lodging and disease pressure increases at higher seeding rates so growers should not pay a higher seed cost/acre to increase lodging and disease pressure if planting wheat in September this year. We initiated a 3-year study at the Aurora Research Farm in 2015 that will compare the corn, soybean, and wheat/red clover rotation under conventional and organic cropping systems during the 3-year transition period (2015-2017) from a conventional to an organic cropping system. We used three entry points or previous crops in 2014 to initiate the study: 1) small grain, 2) grain corn, and 3) soybean. Two of the many objectives of the study are to determine the best previous crop and the best crop to plant in the first year of the transition from conventional to organic cropping systems. This article will discuss soybean emergence, soybean populations at the 2nd node stage (V2) and weed populations in soybean at the full pod stage (R4 stage). We used the White Air Seeder to plant the treated GMO soybean variety, P22T41R2, and the non-treated non-GMO, 92Y21, at two seeding rates, ~150,000 and 200,000 seeds/acre. Unlike the corn comparison, P96Y21 is a not an isoline of P22T41R2 so only the maturity of the two varieties and not the genetics are similar between the two cropping systems. As with corn, we treated the non-GMO, 92Y21, in the seed hopper with the organic seed treatment, Sabrex, in the high input treatment (high seeding rate). Unlike corn, however, we used different row spacing in the two cropping systems with the typical 15” row spacing in the conventional cropping system and the typical 30” row spacing (for cultivation of weeds) in the organic cropping system. Consequently, in comparing days to emergence and the early plant populations of the two crops under two cropping systems, the soybean comparison is not as robust as the corn comparison because of the different row spacing and genetics between soybean varieties in the two cropping systems. We applied Roundup (PowerMax) at 32 oz/acre for weed control to conventional soybean at the V3-4 stage (June 27) under both recommended and high input treatments. We used the tine weeder to control weeds in the row in organic soybean at the V1 stage (June 5), if corn was the previous crop but not in the other two experiments. We then cultivated close to the soybean row in both recommended and high input organic treatments at the V2 stage (June 20) with repeated cultivations between the entire row at the V3 stage (June 25), beginning flowering (R1) stage (July 6), and full flowering (R2) stage (July 16). The high input soybean treatment in the conventional cropping system also received a fungicide application at the beginning pod (R3) stage (July 31) for potential disease problems and overall plant health. Weather conditions were warm and dry for the first 7 days after planting. Soybean emergence was consistently 1 day earlier in the organic vs. the conventional cropping system for all three entry points (Table 1). Pioneer rated P92Y21, the variety used in the organic system, with a higher field emergence score (8 out of 10 rating) compared with P22T41R2 (7 out of 10), which is probably the main reason for the earlier emergence of soybean in the organic cropping system. The organic cropping system also was planted in 30 inch rows so there were 8.5 or 11.5 seeds emerging through the soil in 1 foot of row in the organic system compared with 4.25 or 5.75 seeds emerging in 1 foot of row in the conventional system, which may have hastened emergence in the organic cropping system. 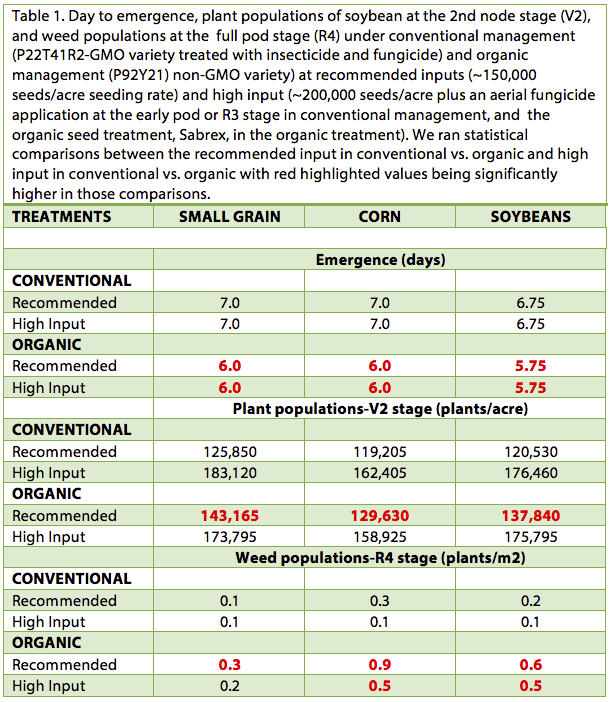 Days to emergence did not differ between the conventional and high organic cropping system, indicating that Sabrex, the organic seed treatment, did not hasten soybean emergence in 2015. We estimated soybean plant populations in at the V2 stage (June 18), just prior to the cultivation close to the soybean row on June 20. Soybean in the organic cropping system under conventional inputs had greater plant populations or stand establishment than its counterpart treatments in the conventional cropping system in all three studies (Table 1). Soybean in the organic cropping system under high inputs, however, had similar plant populations compared with soybean in the organic cropping system under high inputs. It is not clear why there was an interaction between cropping system and management inputs for plant populations. Nevertheless, plant populations exceeded 119,000 plants/acre in all treatments, which should provide adequate plant populations in all treatments for soybean to realize its yield potential. We will estimate soybean populations again at harvest to determine the extent of crop damage during the four to five cultivations in the organic cropping system. Weed densities in all conventional soybean treatments were less than 0.3 weeds m-2, indicating excellent control of weeds with a timely Roundup application (Table 1). Also, weather conditions were dry (~2.0 inches) after the July 16 cultivation through the R6 stage (August 20). Weed densities in all organic soybean treatments were less than 0.9 weeds m-2, indicating good control of weeds with timely cultivations (Table 1). We believe that weed densities of less than 0.9 weeds m-2 will result in minimum yield reduction. Weed densities were lower in the high input vs. the recommended input treatment in the organic system only when corn was the previous crop, presumably because the higher soybean plant populations resulted in a more competitive crop in a field with inherent higher weed densities. Still, any yield differences associated with improved weed control could be offset by greater crop stress at the higher plant populations during very dry and warm conditions during the first 10 days of September (R5.5 to R6.5 stage). In addition, the dry conditions resulted in zero visual symptoms of disease in any of the soybeans from the R3 through R6.5 stage, which probably negated the need for a fungicide application at the R3 stage in the high input conventional management treatment. In conclusion, organic soybeans, which do not require fertilizer N so did not lose any N during the wet spring conditions, looked to have the same yield potential as the conventional soybeans at the physiological maturity (R7.0) stage (~September 15). Plant populations were similar or higher in the organic management systems. Although more weeds were observed in the organic compared with the conventional cropping system, weed densities averaged less than 0.9 weeds m-2 in all organic treatments, which probably had limited impact on yields. Based on visual observations, soybean compared with corn looks like a better crop during the first transition year from conventional to organic management because of much better N status of soybean, the similar plant populations, and the more competitive nature of soybeans vs. corn with weeds.